Create a portrait photo album with bonusprint for all your favourite family snaps and to show off your portrait photography skills. They’re easy to customise any way you like. So, get creative and order yours online. If you love capturing those special moments with your friends and family, why not relive them in a portrait photo album? A portrait photo book can give the selfies on your smartphone a new lease of life or display all the spontaneous snaps of the people you love. There is a range of sizes to choose from too. For a great gift idea, you could personalise a medium portrait photo book with the images of your best friends. And with an extra-large portrait photo album, you could create a statement coffee table book for your home. Here’s how to get started. Our creator tool gives you the option to personalise a photo album in portrait, landscape or square. When you’ve selected portrait, simply pick the size you want to use. Then it’s time to get creative and have some fun. Upload the snaps you love, experiment with layouts and start making your portrait photo book just the way you want it. You can also add clip art and text, plus there’s a great range of background colours and patterns to try out. 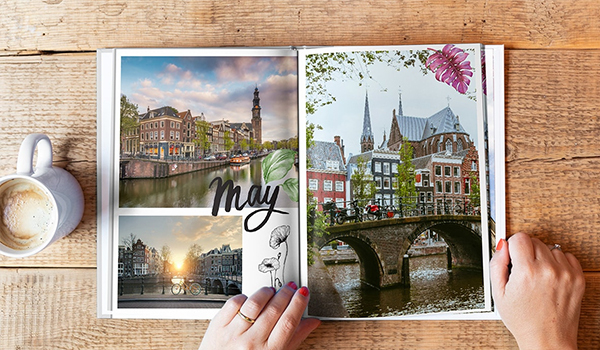 Take a preview of your photo book. If you’re happy with the layout and your snaps are looking perfect, click ‘add to basket’. You can start adding the finishing touches to your portrait photo book here, like glossy pages to make colours pop in your pictures. You can choose a linen or faux leather cover and add a title to your book too. Or to make your portrait photo album even more personal,add your own image to the front cover instead. All you need to do next is place your order and get your book delivered to your door.